Today I am here with Tom Feister who is a black belt from Relson Gracie and he trains in Columbus, Ohio. Tom came to visit me here at my new academy in Bedford, MA. I am asking Tom to show us one of his favorite techniques. 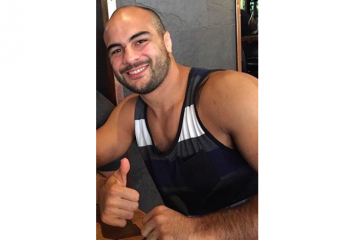 I had the chance to roll with him and I was able to see that he has a very good omoplata. 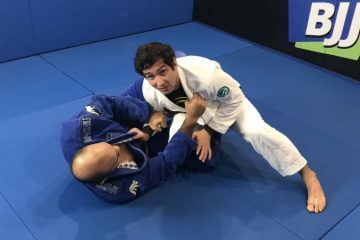 I asked Tom to show us how he like to finish his omoplata because it is very good and very different. He does to the monoplata which is actually one of Marcelo Garcia’s favorite submissions. Tom has a crazy good monoplata and it reminded me of Marcelo. Let’s take a look at the video below and then I will do a break down. So guys the monoplata is one of the best submissions and many people do not like to use it. 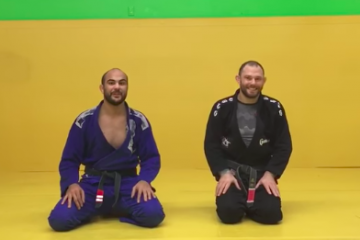 As you can see in the video above, when Tom gets the omoplata he knows that his opponent is going to roll and since he knows that he is able to follow. When he follows he changes his body so that he has my arm completely isolated. Once he is in the position he is able to adjust and trap my tricep so that I do not pull my elbow out. This is very important to remember, always control the tricep. Now he is ready to switch to the monoplata, he does not go for a triangle because he can get half guarded or they can keep their arm in. Once he is in the monoplata all he has to do is turn the knee by my head to put a lot of twerk on my shoulder. This is a super good submission guys. Anyways I hope you like it and if you have not already download my FREE E-book! I go over a lot of things people ask me at seminars and on messages! Also the omplata is one of my favorite submissions and I have a whole DVD on it, check out the digital download below! OSS!